This is a combination of a traditional manicotti and a crepes recipe. Italian manicotti is a wonderful mix of flavors. This recipe combines spinach, ground beef, garlic and parmesan cheese for the filling. Cook the spinach according to the directions on the package. Drain well. In a large skillet, sauté the onion and garlic in butter until golden brown. Add the beef and brown, stirring frequently. Remove the skillet from the heat and pour off any excess grease. Stir in the spinach, salt, pepper and parmesan cheese. Fill the crepes with the meat mixture and roll the crepes up loosely. Place the crepes in a large, shallow baking dish. Top the crepes with the mozzarella cheese. For the sauce, melt the butter in a saucepan. Blend in the flour and gradually stir in the milk. Cook and stir until the sauce thickens and comes to a boil. Stir in the salt, pepper and cheese. Spoon the sauce over the crepes. Bake for 20 minutes or until the sauce is bubbly. Pour hot tomato sauce over the manicotti if desired. This recipe calls for crepes instead of pasta. Substitute manicotti pasta tubes if you prefer. Just boil the manicotti pasta, fill the tubes and bake as directed in the recipe. The tomato sauce is an option. The recipe tastes delicious with just the cream sauce, but a bit of tomato sauce poured over before serving adds nice flavor too. Try it both ways and see what you prefer. 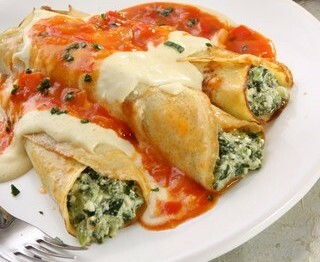 Instead of pasta tubes, the filling is rolled in crepes. Never made crepes before? Not to worry. It is easy with our basic crepes recipe found here. If you have visited this site much before you know my theory – you can almost always switch up a recipe a bit to suit you. This recipe is no different. Don’t want to use crepes? Simply replace the crepes with manicotti pasta for an easy manicotti recipe you will make over and over. The crepes are a nice alternative though. They are light and make a nice change from pasta. The use of tomato sauce is also an option. The recipe calls for a lovely cream sauce over the manicotti and that tastes delicious. Some people will also like a bit of tomato sauce poured over the manicotti. It gives that nice traditional flavor to the dish. See the image above for the way it looks with the tomato sauce and the cream sauce together. The filling in this recipe is pretty healthy, with spinach, garlic and ground beef. If you want to make it even healthier, use just the tomato sauce and omit the cream sauce. It won’t be as rich but will still taste fantastic. I have included this manicotti crepes recipe as one of our diabetic recipes because it isn’t too high in carbs if you consider that it is pretty much a meal in itself. 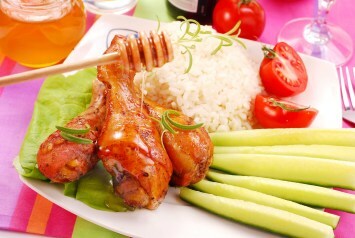 Just add a large salad for a great meal. I would also just use the tomato sauce and omit the cream sauce for a healthy diabetes diet. I think you will love this Italian manicotti recipe. If you do, I’d love you to Pin it to Pinterest, Tweet about it, Like it on Facebook and leave a comment and your favorite Italian recipes below. Make this lovely caprese salad to go with the manicotti crepes recipe. The rest of our delicious Italian recipes can be found here.